Choosing a handheld GPS for your boat, whether as a primary or back up navigation device, amounts to determining how you intend to use this tool and how much you are able and willing to spend to acquire hardware and software. Today’s handheld GPS units range from roughly $100 to $500. The more expensive units have larger, high resolution color screens, built in cartography or mapping and the ability to add memory. Less expensive models come equipped with monochrome display screens and limited or no cartography. Again, how you use the GPS will likely dictate how much you spend. So let’s talk about uses. If you’re going to be taking the unit on and off the boat multiple times during the boating season, and you’re a bit clumsy to boot, consider a handheld that floats. Any unit you choose to buy for the boat should be waterproof. Are you going to use your handheld GPS as your primary navigation tool or a backup to a permanently installed marine GPS chartplotter? 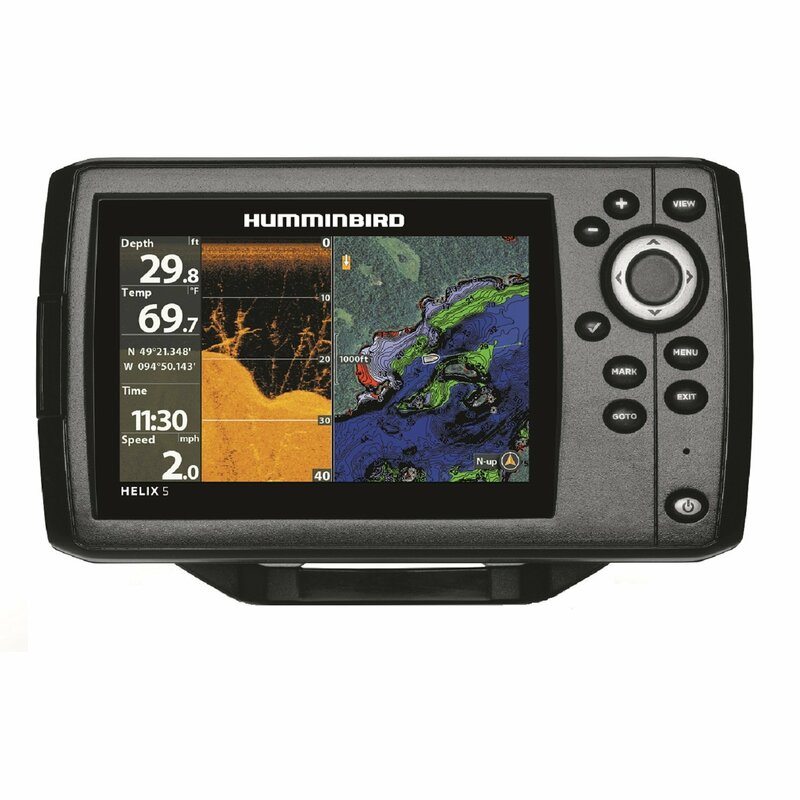 If the handheld will be your main navigational guide, you will want to mount it in a helm location so you can see, operate it easily, and most importantly—connect it to ships power so you dont have to rely on the unit’s internal batteries. If your boat has a hardtop, signal reception could be an issue, so to preempt any possible issues test your handheld for good satellite reception at its planned location aboard. As a last resort you may be able to buy an optional external antenna to improve satellite signal reception. Battery life is major consideration for the boater who intends to use the unit as a backup to a fixed-mount primary GPS navigation system. Even when used as a backup it is still a good idea to power the unit via a 12-volt receptacle supplied by ships power. Make sure that receptacle is clean and corrosion free. Are you going to use the GPS handheld in your car as well as your boat? Most handhelds are tailored more toward land use than marine use so finding a multi-use unit will be fairly easy. If you hike or hunt, those are factors, too. Land-use features should be included in the model you choose. Will size play a role in your purchase decision? Some units are pocket size, or no larger than some cell phones with screens are only about 1.5 inches by 2 inches. Larger handheld GPS units, which could measure as much as 6-inches tall and 3-inches wide, will have easier-to-read display screens that range in the neighborhood of 3-inches on the diagonal. Still no handheld will have a really large screen and reading these units under tough marine conditions can be trying at times. Buttons and controls are important, too. Some newer more sophisticated handhelds even feature touch screen operation. Most units have front-mounted buttons for functional control, while some carry additional buttons on the side. Choosing a Handheld GPS—Chart or Not? Do you need cartography or mapping capabilities? Boaters who will use the handheld as a backup may consider buying a less expensive, basic model without cartography. Even if it is your primary GPS, you may not need mapping capabilities. You can create your own maps by setting waypoints along a track, sort of leaving a bread crumb trail. Some units have a track-back feature that allows you to reverse the course you have just run and follow it back. Preloaded or downloadable charts are impressive and add significant value for the mariner. Not all handheld GPS units sold today have marine charts available, so before you buy make sure this is an option. One big downside users may face when using a handheld GPS with charts onboard is the difficulty one can encounter trying to read details. Another is the lack of perspective available when viewing the chart at a large range, you just cant see that much detail when you range out for the big picture view. Accuracy of today’s GPS machines is better than ever. Most are WAAS-capable, meaning they’re accurate to within about 10 feet. Choose a unit that has WAAS capability to get maximum position accuracy for navigation. Will a model with a monochrome screen do the job or do you find a color screen easier to read? If you are looking at a unit without charting or mapping capabilityes there is simply no real need for color. If you are considering using your unit with onboard marine charts you will find that the chart is easier to read and supplies more information on a good quality color display screen. Can the unit be hooked up to a computer via a USB port to transfer data? This capability could be very important for users with lots of waypoints electronically stored. No one wants to enter any quantity of data into a handheld by any means other than download. Things are just too tedious and slow because of the lack of keyboard. Choosing a Handheld GPS—How Much Memory? GPS manufacturers pack their handheld GPS units with features such as the capability to store 1,000 or more waypoints. Ask yourself: Based on my use, do I really need 1,000 waypoints? A weekend boater who does little cruising but a lot of water sports would be less concerned with waypoints and more concerned about how easily he or she can read the MPH display. In contrast, anglers who want to mark their fishing spots would welcome the ability to store large number of waypoints but may care less about tracking speed. Most handhelds have some pretty nifty features, including electronic compasses, barometric altimeters and fishing charts. Some manufacturers also offer handhelds with Family band radio capabilities for communication from the boat to the shore or between boats. A GPS and VHF radio combo handheld is on the market, too. The first Garmin portable GPS navigator to become a popular piece of marine electronics aboard boats was the Garmin 48. State of the art in its day, this unit was primitive by today’s marine GPS handheld standards. It simply supplied latitude and longitude plus calculated speeds, course to steer, and estimated times of arrival. It was not always very accurate either with only basic GPS reception that was subject to the vagaries of Selective Availability. Thankfully today, with SA turned off and the addition of WAAS receive capability—all the Garmin portable GPS units we’ve tested have high levels of position accuracy. The original non-mapping Garmin 60 was waterproof and featured a WAAS-enabled GPS receiver. It could store up to 500 waypoints and 50 routes. Data was displayed on a 4-level gray scale LCD screen. A later release featured mapping capability. The Garmin 60CS added a color screen, storage for 1000 waypoints, and 56MB of internal memory. This unit displays information on a 256-color TFT screen. It also featured a built-in barometric altimeter and an electronic compass. The latest incarnation of this series is the Garmin 60CSx. It adds a microSD card slot and a high-sensitivity receiver. This new series consists of five models from the most basic to a camera, sensor, and map equipped portable. The top unit in this series for the mariner is the Garmin 62s, which comes standard with a base map but needs additional cartography to excel as a marine navigator. The Garmin 72 was the first in this marine-friendly series of handheld GPS units. The latest version of this unit is the Garmin 72H featuring a high-sensitivity receiver. An upgraded follow-on was the Garmin 76. It featured mapping capability with 8 MB of internal storage. This unit was also waterproof, stored up to 1000 waypoints, and used a 4-level gray scale display screen. The Garmin 76Cx followed with a high-sensitivity receiver, microSD card slot, and a color display screen. The most sophisticated unit in this series is the Garmin 76CSx. This one adds a barometric altimeter and an electronic compass. Garmin has just released the new 78-series handheld GPS lineup. The basic Garmin 78 features a shaded-relief base map, high-sensitivity GPS sensor, and microSD™ card slot for additional storage capacity. Next up is the 78s, this one adds an internal electronic compass and barometric altimeter. The flagship model is the Garmin 78sc. In addition to all the previously mentioned features it adds preloaded U.S. coastal cartography. The lightest and most compact handhelds in the Garmin portable GPS lineup are the eTrex series. The least expensive base model is the Garmin eTrex. It uses a 4-level gray scale display and can store up to 500 waypoints. The eTrex H adds a high-sensitivity receiver. An upgrade to the Garmin eTrex Legend H gets you a higher resolution screen, storage for up to 1000 waypoints, and 24MB of internal storage for charts. The most advanced unit in this line is the Garmin eTrex Vista HCx. It features a high-resolution color screen, microSD card slot, barometric altimeter, and an electronic compass. Garmin also markets the eTrex Summit and eTrex Venture. Two recent additions to the eTrex lineup include the Garmin eTrex 20 which fits the current array of eTrex units as a mid-level unit. Notching up one level you will find the more sophisticated Garmin eTrex 30. The newest units in the Garmin portable GPS lineup are the Colorado and Oregon series. You’ll find the biggest screens ever in these units and all the latest features including high-sensitivity GPS sensors, wireless data transfer, and preloaded charts. The Garmin Colorado 400c features preloaded Bluechart cartography, a pair of soft keys, and the Rock ‘n Roller™ controller. The touchscreen operated Garmin Oregon 400c has a clean button-free look, easy operation, and preloaded Bluechart cartography. Newer Oregon series units are bred for the trail but when you add a microSD™ card with BlueChart cartography even the Garmin Oregon 450 becomes a powerful marine navigator. At the top of the Oregon lineup sits the digital camera equipped Garmin Oregon 550. The majority of Garmin’s handheld GPS units can be loaded with optional chart and tide data. You can see our review of the Garmin MapSource CD here to see how this works. Garmin 78sc is at the pinnacle of the three model 78-series marine handheld GPS lineup. Not only does this unit float, it also features a high-sensitivity GPS receiver, and two onboard sensors, an internal electronic compass and barometric altimeter. The “c” designation in the model number indicates this portable GPS comes preloaded with Garmin BlueChart coastal charts covering U.S. waters while the “s” stands for sensor equipped. The grey, black, and silver case measures 6.0-inches tall, 2.6-inches wide, 1.2-inches thick and with a pair of AA batteries installed tipped our scale at 7.8 ounces. The unit will lay flat in a table top and not slide around much because of rubber covering over the battery case door and protective weather flap hiding an external antenna jack, mini USB port, and a Garmin 4-pin serial connection. Rubber side grips enhance the feel in hand. I found the Garmin 78sc easiest to operate while holding it in one hand and button pushing with the other. However, for more manually adept users it is possible to operate the pushbuttons located on the top third of the front panel with the thumb without blocking out large portions of the screen. In the box with this floating handheld marine GPS unit you’ll find a USB cable to connect to a personal computer, a wrist strap that attaches at the case bottom, and a pamphlet size quick start manual which lists basic operating instructions. To learn more about your 78-series handheld GPS you’d need to go to the Garmin website and read the full owner’s manual there, or download, or print it. Eight pushbuttons, with on-button function labels, and a single 4-way rocker switch provide operational control of all functions. Two of the buttons also have their secondary function label printed on the case face adjacent to the key. The Garmin 78sc has five main pages, each one automatically selected with a single press of the Page button gives the user easy access to most functions. Hitting the Quit button brings up pages in reverse order. The first page in sequence is the Map page and since the 78sc is preloaded with U.S. marine charts you’ll find highly detailed cartography here. Next you will see the Compass page with its compass rose, waypoint bearing pointer, and data boxes. The Trip Computer page is loaded with lots user adjustable data boxes. The last main page of interest to mariners is the main menu page. Each press of the Page button slides a page icon graphic along an onscreen tape displayed over the top the last selected page. When you stop pressing Page the new appears automatically about two seconds later. It is a very slick interface. An easy way to save a present position waypoint in the Garmin 78sc is with a press and hold of the Mark button. This creates the waypoint and brings up a waypoint data page where you can either just hit enter to save it as is or change the associated icon, name, add a note, or change the latitude/longitude. An icon can be selected from one of several large groups with names like markers, marine, or outdoors. Waypoint names can be up to long and are enter with by using the rocker and enter key to scroll around an onscreen number and letter display. This is a notch above scrolling though numbers and letters for data entry. Use of the built-in route planner made constructing a route very easy. I simple stepped through a few menu pages to select a new route with point chosen from the map. From there you simply move the cursor and hit the enter key to add a point. Pressing quit saves the route automatically. With a large internal memory this Garmin handheld will store up to 2000 waypoints and 200 routes. That is pretty impressive storage capacity for a portable GPS. Because of their overall size the front panel on the 78-series units has plenty of room for a respectably sized display screen. The Garmin 78sc screen occupies the lower two-thirds of the front face and features a portrait layout with a width of 1.6-inches and height of 2.2-inches. This TFT color screen carries a 160 x 240 pixel resolution and measures 2.6-inches on the diagonal. A single quick press of the off/on button brings up a screen backlighting menu page that includes the date, time, battery level, and GPS signal strength meter, as well as a 21-position slider. You can adjust the screen backlight here or keep doing quick presses of the on/off button and select either minimum, maximum, or mid-level brightness. I am going to rate the display screen on the Garmin 78sc excellent. When I viewed it outside in sunny conditions I found it easy to read with or without my polarized sunglasses. I found this compass page best for navigating back to an MOB point. I found the Compass page provided the best default navigation back the MOB point. You’d simply follow the bearing needle in the compass rose and use the data box info to know when you arrive. To effectively use the map page for navigation back youd need to have previously setup the proper data box information or all youd have here would be an onscreen course line. I prefer to see an MOB function that operates with a single button push and has an automatic screen switch to graphic and numerical navigation data back to the point. A rubber covered battery compartment door located on the case back houses the batteries and the microSD™ card slot. The mechanism on this door is new for Garmin. It uses a spring release slider to open and remove the door. I found replacing the door to be a two-step process where the end with locking mechanism was pushed in first and then the bottom had to be pressed into place with both hands. If you neglected the last step the unit would lose its watertight integrity. A mini USB port, serial port, and external antenna jack, all located on the case back, are all covered with a protective weather flap. There is an optional marine dash mount and power cable available that would facilitate permanent mounting on your boat. This Garmin portable GPS will do a wireless data transfer with other capable Garmin units. Marine information about navigation markers, tides, currents, and nearby marine services can be found via the Find key. This Garmin portable GPS is not only rated waterproof to IPX7 standards, it floats too, a great advantage for gear to be used aboard a boat. The IPX7 rating means it can be submerged to a depth of 1 meter for 30 minutes without suffering any damage. It passed the dunk and drop test with no problems. The unit carries a 1-year warranty. The Garmin 78cs has a bright display screen, up to date intuitive operating software, detailed onboard marine cartography, as well as lots of other marine related information built-in. I’d rate is as one of the most sophisticated marine handheld GPS units on the market today. The Garmin 62s is one of five models in the new 62-series of handheld GPS gear to hit the Garmin lineup recently. All units in the 62-series feature a high-sensitivity GPS receiver, color display screen, and world base map. The “s” designation in the model number of our test unit indicates this portable GPS is equipped with two internal sensors. The one of particular interest to mariners is the 3-axis electronics compass. This unit also has a built-in altimeter. Other models in the 62-series are also fitted with a camera and/or preloaded topographic maps. The mostly grey case measures 5.0-inches tall, 2.2-inches wide, 1.4-inches thick. A solid stub antenna up top adds another 1.3-inches to the overall height. With a pair of AA batteries installed our Garmin 62s tipped the scale at 7.6 ounces. This handheld GPS is a rounded design best carried with its carabiner equipped belt clip. A protective weather flap on the case back hides an external antenna jack and mini USB port. Since I am right-handed I found the unit easiest to operate while holding it in my left hand and button pushing with my right. However, for more manually adept users it is possible to operate the pushbuttons located on the bottom third of the front panel with the thumb without blocking any portion of the display screen. In the box with this handheld GPS unit you’ll find a USB cable to connect to a personal computer, a belt clip with carabiner, and a pamphlet size quick start manual with basic operating instructions. To learn more about your 62-series handheld GPS you’d need to go to the Garmin website and read the full owner’s manual online, or download and print it. To make the 62s a reliable marine handheld GPS navigator requires the addition of an optional chart package. For my testing, I opted for a pre-programmed Garmin data card that was not only loaded with BlueChart g2 marine charts, but also featured tide, current, depth contour information as well as port services like where to buy fuel, water, or food. Eight front face pushbuttons, with on-button function labels, and a single 4-way rocker switch provide the user with operational control. A side mounted pushbutton turns the unit on or off. A single press of the Page button sends you to the next main page selection. The first in sequence is the Map page and since our test unit was packing a BlueChart marine card the map page displayed a finely-detailed marine chart. Next in order is the Compass page with its compass rose, waypoint bearing pointer, and user selectable data boxes. Third in order is the Trip Computer page which displays a myriad of adjustable data boxes. The last main page of interest to mariners is the Main Menu page. Each press of the Page button displays a page icon graphic in onscreen tape which shows over the top the last selected page. Each successive press of the Page button moves the next page icon down the tape. When you stop pressing the button the new page appears automatically about two seconds later. Very nice interface for the user. An easy way to save a present position waypoint in the Garmin 62s is with a quick press of the Mark button. This creates the waypoint and brings up a waypoint data page where you can either just hit enter to save it as is or change the associated icon, name, add a note, or change the latitude/longitude. The icon to be associated with the waypoint can be selected from one of several large groups with names like markers, marine, or outdoors. Waypoint names can be up to 30 characters in length—finally waypoint names long enough to be descriptive can be entered, good on Garmin. Letters or numbers for a name are chosen by using the rocker and enter key. You would scroll around onscreen and highlight each number or letter in order and then press enter. This is a notch above scrolling though list of numbers and letters for data entry. Use of the built-in route planner, select from the Main Menu, made constructing a route very easy. Basically you just follow through each menu step of the process and hit the Enter key. Once the first waypoint is selected you simply move the cursor and hit the enter key to add another point. Pressing quit saves the route automatically. With a large internal memory of 1.7 GB this Garmin handheld will store up to 2000 waypoints and 200 routes. That is an impressive storage capacity for a handheld GPS. The Garmin 62s color display screen is fairly large for a handheld GPS and occupies the upper two-thirds of the front panel. It features a portrait layout with a width of 1.4-inches and height of 2.2-inches for a diagonal measurement of 2.6-inches; it carries a 160 x 240 pixel resolution. A single quick press of the off/on button displays a screen backlighting menu page that includes the date, time, battery level, and GPS signal strength meter, as well as a 21-position screen brightness slider. You can adjust the screen backlight here using the rocker switch or with successive quick presses of the on/off button. Using the on/off button will set minimum, maximum, or mid-level brightness. I am going to rate the display screen on the Garmin 62s excellent. When I viewed it outside in sunny conditions I found it easy to read with or without my polarized sunglasses. The Garmin 62s, because it is primarily marketed for land use, does not have a built-in man overboard function. As a poor man’s MOB you could use a quick press of the Mark button followed by the Enter button. This would build a waypoint at that position and allow navigation back to that point. A battery compartment door located on the case back houses the batteries and the microSD™ card slot. A simple twist lock at the bottom of the door opens it. To access the card slot you will need to remove the pair of AA batteries the power the unit. A mini USB port and external antenna jack, both located on the upper case back, are covered with a protective weather flap. This Garmin handheld GPS is capable of doing wireless data transfer with other Garmin units that are also equipped to do so. Marine specific information covering things like navigation markers, tides, currents, and nearby marine services can be all be found quickly by using the Find key. Remember much of this data is stored on the optional chart card I used for testing. This Garmin portable GPS is rated waterproof to IPX7 standards. The IPX7 rating means it can be submerged to a depth of 1 meter for 30 minutes without suffering any damage. The Garmin 62s has a crisp display screen and up to date intuitive operating software. However without the addition of an optional BlueChart marine chart card for your area it will lack detailed onboard marine cartography, as well as other valuable marine related information. The Garmin Oregon 550 is a compact handheld GPS with touchscreen control, a high-sensitivity GPS sensor, 3-axis tilt-compensated electronic compass, altimeter, microSD™ card slot, and a 3.2 megapixel auto-focus camera. This Garmin portable GPS new addition sits at the pinnacle of the Oregon lineup. Memory capacity and waypoint storage have increased significantly from earlier Oregon models. Earlier and less expensive Oregon models are still available from Garmin. The Oregon 300 features a world base map, while each variant of the 400 adds specialized mapping. The 400t is preloaded with U.S. topographic maps, 400i has U.S. inland lakes, and the 400c packs U.S. BlueChart cartography. The new Oregon 550 features a world base map. The Oregon 550 is a small unit overall and measures just 4.5-inches tall, 2.3-inches wide, and 1.4-inches thick. With the accompanying pair of rechargeable NI-MH AA batteries installed it weighed 7.3 ounces on my scale. A USB port protected with a weather cap is located at the bottom of the case while a single on/off pushbutton is molded into the case side. The 550 comes packaged with a USB data cable, carabiner clip belt clip, quick start guide, owners manual on CD, AC battery charger, and a pair of nickel metal hydrite 2000 MaH AA batteries. The charger ships with a variety of AC plug adapters. The Oregon 550 comes with a basic world base map, to make this unit a viable marine navigator would require purchasing BlueChart g2 cartography for your area. The Oregon 550 is best used while holding with one hand and pressing onscreen prompts and commands with the other free hand. This unit has a side mounted on/off switch that also brings up a screen brightness menu. The menu page shows function icons as well as battery and GPS signal strength. Six page icons are displayed at one time on the main menu page, several pages exist and can be shown in order by pressing the next page arrow field. The pages I found most useful for on the water navigation were Map, Where To, Compass, Mark Waypoint, Waypoint Manager, and Trip Computer. As you page through menu pages you’ll notice both a battery level indicator and GPS signal strength meter at the bottom of the pages. The Map page in the test unit showed very little detail since it was equipped with only a base map. Any serious marine navigation would require the purchase and installation of appropriate Garmin BlueCharts. The Where To page offers the user a long list of places to go that includes waypoints, photos, tracks, tides, and more. The compass page features user selectable data boxes and a large compass rose. From the Map page you can simply touch the screen to create a destination for navigation. When you press the screen the position, bearing, and distance to that point are shown onscreen. Pressing this field takes you to another page that allows you to go to the point. To create and save a waypoint youd need to go the Main Menu page and select Mark Waypoint. Then choose to save the point or save and go directly to the edit waypoint menu. From here you can change the name, position, symbol, or add a comment. Routes are built and saved easily from the Route Planner page. I built a short route by touching the screen on the map page and adding more points in sequence the same way. It took just a few seconds to build a usable route. You can also choose new route turn points from a variety of lists. The Garmin Oregon 550 has 850 MB of built-in memory and will store up to 2000 waypoints and 200 routes. By adding an optional microSD™ card the information storage capacity is increased significantly. The majority of the 550 front face is filled with a 3.0-inch color TFT display screen. The screen is approximately 1.5-inches wide by 2.5-inches tall and boasts a 240 x 400 pixel resolution. There are no pushbuttons on the face of this unit, virtually all functions are controlled with the onscreen touch fields. A single quick press of the on/off switch located on the side of the unit brings up the screen brightness menu. From here you can use the plus/minus fields displayed onscreen to adjust the screen backlight level. I viewed the Garmin Oregon 550 display screen outside in bright sunlight and found it very readable. It dimmed very little when I donned my polarized sunglasses but does darken when tilted at certain angles. I am rating the Oregon touch screen a good for daylight viewing and excellent for low light and nighttime use. One feature you don’t often see on a handheld marine navigator is a camera. Well this one has a 3.2 megapixel digital camera with autofocus and a 4x zoom. I tried it on a fishing trip and found it easy to use. Photos can be viewed on the screen or easily downloaded to a computer. Here is sample photo taken with the 550. To activate the unit’s man overboard function requires the user to go to the main menu, find the MOB icon, and then select it. To do the actual navigation back to the MOB position I preferred to use the compass page. There is certainly better MOB functionality out there in some other units I reviewed, but this one does get the job done, even though it is a bit cumbersome to use. The Garmin Oregon 550 shares a special feature with a few of its cousins, including the Colorado, Dakota, and the new 78-series. It can wirelessly share data like waypoints, tracks, and routes with another compatible Garmin handheld GPS. Because of the touchscreen interface changing up data boxes to show different source data is very easy. Simply touch the box you want to change, then choose the data source from a menu list. Screen redraws on our test unit were fast, however with only the base map installed not much chart information appears anyway. As Ive seen in other units in this series chart redraws slow significantly when full marine charts are installed. The sealed AA battery compartment is accessed by flipping a latch that facilitates removal of the case back. To get to the microSD™ card slot youll need to remove the batteries. A mini USB data port is located on the bottom of the unit and protected from weather by form-fitted rubber flap. This Garmin portable GPS is rated waterproof to IPX7 standards, meaning it can be submerged to a depth of 1 meter for 30 minutes without suffering any damage. The unit carries a 1-year warranty. The Garmin Oregon 550 passed both our dunk test and drop test with no problem, but does not float. With the optional BlueChart cartography installed the Garmin Oregon 550 would make for a real feature packed portable marine navigator. Without the added charting software Id opt for another more desirable unit like the Garmin Colorado 400c or Garmin 78sc.